If I had my druthers, I think I'd just be putting bites of food into my mouth all day long. Alas and alack, my job and life in general don't accommodate that, and I'm compelled to eat three normal meals a day, with strategically planned snacks here and there. When I do get to shift into graze-mode, though, it's handy to have a snack cake on hand, and this is a great one! It contains a huge amount of applesauce, so it's dense and moist without requiring much help from the addition of butter or oil. The spices are subtle but noticeable, the pecans on top add a nice crunch, and you can add chocolate chips to make it a passable option for dessert, though it is absolutely appropriate any time of day. If you'd like to substitute some whole wheat flour, go for it! Change the nuts, or even exclude them...replacing them with chocolate chips (or cinnamon chips! ), of course. For this particular cake, I only put the topping on half and left the remainder naked. Might I take this opportunity to praise some products I recently received to try? Thanks. TSP (Totally Sweet Products) has a new collection of vintage-styled baking products and decorating accessories based on the tools used by professional pastry chefs, and the ones I've tried out are terrific! The spatulas have such unique shapes, and I didn't really realize how easy getting every bit of applesauce out of the jar could be until I broke out their freesia spatula. Nooks and crannies have nothing on me now! Preheat the oven to 350 degrees F and lightly grease a 9x13-inch baking pan. In a large bowl, whisk together the applesauce, butter or oil, eggs, vanilla, and sugars. Add the flour, baking soda, salt, cinnamon, nutmeg and chocolate chips, if using; stir until just combined, but don't overmix. Mix the topping ingredients together in a small bowl, then sprinkle them evenly across the top. Bake for 28-30 minutes until the top springs back lightly to the touch and a toothpick inserted in the center comes out clean. The topping makes the cake, doesn't it? This is utterly delicious, Grace. I have to practically keep the kitchen empty so I don't graze!!! Your cake would be so tempting. Bet you get a ton of hits on this recipe...that walnut snack cake I posted got more hits than anything in months. Guess everyone wants little cakes like these. I too, am a grazer. This cake looks FANTASTIC! My guys would love this! This sounds simple, and simply delicious! Yum! This cake looks amazing! 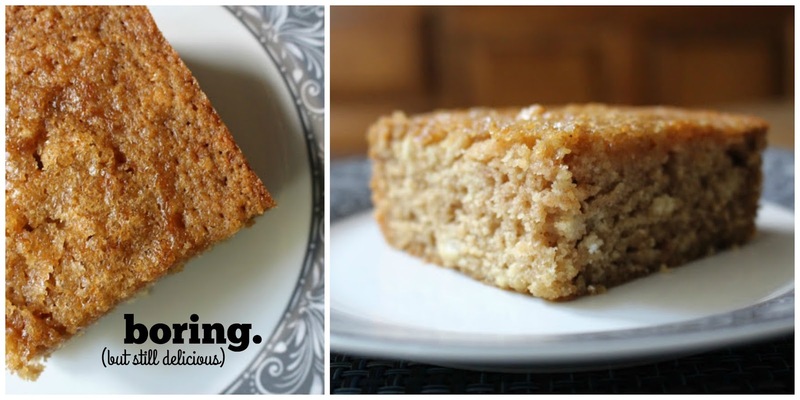 The is a wonderful recipe, unlike any cake I've ever made... We enjoyed it with coffee. I think next time , I will leave the chips out of the batter. You did really fancy up this cake beautifully Grace. Sorry that you are stuck with (more or less) the basic 3 meals a day--but think how dangerous being able to eat all day could be!